With our late summer rains and humidity, you might be seeing outbreaks of pests like scale, white flies and aphids on your shrubs, trees and garden plants. Here is a photo of an outbreak of Scale on Nandinas we discovered at a customer's home. Because these pests can cause a lot of damage to your important foundation shrubs, the earlier we can catch them and treat them the better! 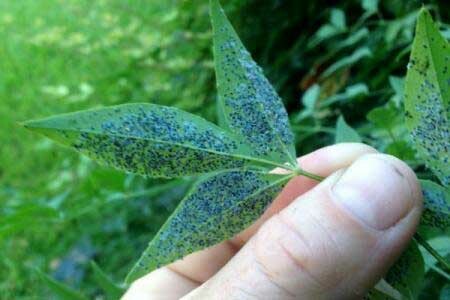 Scale insects feed by sucking sap from your plants plants. They are often a problem on houseplants, hollies, crapemyrtles, fruit trees and many other landscape shrubs. These pests weaken the plants and may excrete a sticky substance called honeydew, which then in turn encourages the growth of sooty mold on the foliage. Sooty mold can block important sunlight from reaching the leaves for necessary photosynthesis. Scale lay their eggs underneath a waxy covering that is hard to penetrate. They then hatch over a period of several weeks. The immature scale insects, called crawlers, move all over the plant until they locate tender new growth. Then insert their sucking mouthparts and go to work sucking out sap. They will also feed on bark and stems. Female scale eventually lose their legs and antennae and become stationary, growing a waxy coating or armor. Males will retain their legs and wings, but have no mouth parts; they resemble gnats. You want to make sure you don't let infestations like this go untreated, as populations will build and typically over-winter. We have organic and natural treatment options here at Soils Alive to take care of these kinds of pest issues in your landscape. Gives us a call today!